Inspired by the old world charm and opulence of Indian royalty, TISHA by Tisha Saksena offers contemporary products crafted in traditional ways ~ amalgamating a vibrant array of handloom weaves, textiles and intricate embroideries by varied skilled craftspeople from across India. 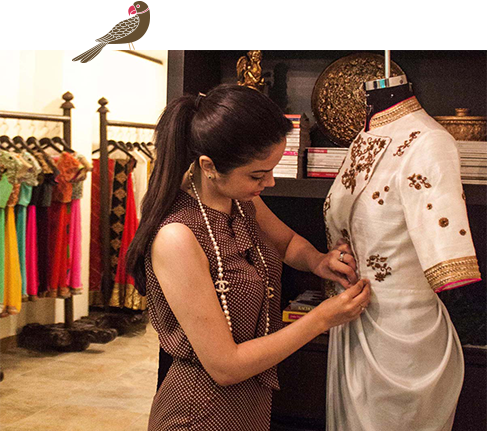 Handmade at every stage with meticulous attention to detail, each luxurious garment is unique and has a distinct character owing to the natural textures of handloom weaves, handspun fabrics like matka silk, tussar silk and raw silk juxtaposed with contemporary silk chiffons and georgettes. These are further embellished with zardozi, gota, mukaish, resham, pearl and badla hand embroideries in traditional motifs and tassels and finishings are painstakingly crafted by hand. 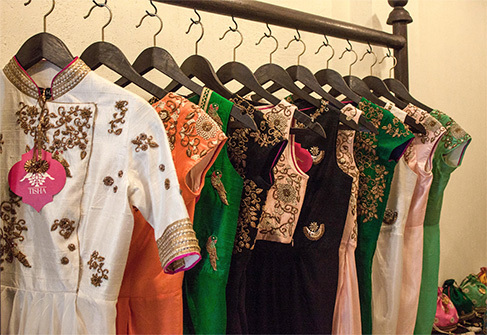 TISHA is an innovative interpretation of Indias rich heritage in a chic, high fashion avatar. Tisha Saksena launched her eponymous label in September 2012 in New Delhi, India. She has lived in several parts of India, and travelled widely, creating her own unique design vocabulary encompassing the indigenous textiles, clothing, crafts and cultural experiences she has absorbed in various states of India balanced with western technical skills of impeccable construction, draping and finish. Her design signature is vibrant and intrinsically Indian in its sensibility but with an understated and classic international appeal. The designer found her calling in fashion during a short stint the National Institute of Fashion Technology (NIFT), New Delhi while simultaneously pursuing a Masters degree in English Literature. She went on to acquire a degree in Fashion Design at The Fashion Institute of Design and Merchandising (FIDM), Los Angeles, USA and began her foray into designing at international high street brands Ella Moss, Splendid and Bebe in Los Angeles. She later worked with designers Shantanu & Nikhil, and Instyle Exports, and as a consultant luxury fashion stylist with Genesis Luxury Pvt Ltd in New Delhi, India.